The BMW i8 represents progress. This sleek, athletic car is classy and comfortable. It's also a hybrid. 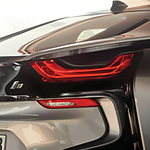 Without sacrificing any performance, the i8 coupe has greatly reduced emissions. These is one of the most unique and innovative cars BMW has produced in years. Between the electric motor and gas engine, BMW's i8 series packs a lot of power. Together, they crank out up to 369hp and an incredible 420 lb-ft of torque. These cars balance this weight by positioning the electric motor in front, and the gas combustion engine over the rear axle. This is a truly balanced car. The BMW i8 coupe is incredibly fun to drive. This car goes from zero to 60 in just 4.2 seconds. To get behind the wheel of one of these great cars, drop by and see us at Bert Smith BMW today. We love showing the i8 series off. These are seriously fun cars.